New Delhi, Dec 5: Vice President M. Venkaiah Naidu, who is also the Rajya Sabha Chairman, on Monday disqualified rebel Janata Dal-United leader Sharad Yadav and Ali Anwar as members of the upper house of Parliament, party leader R.C.P. Singh said. In a Facebook post, Singh said: "Today (Monday) the Chairman Rajya Sabha M. Venkaiah Naidu decided and declared the decision against the petition filed by me against Ali Anwar Ansari and Sharad Yadavji under the 10th schedule of the Constitution of India that the Respondent, Sharad Yadav and Ali Anwar Ansari have incurred disqualification for being a Member of the House in terms of paragraph 2 (1)(a) of the 10th Schedule to the Constitution of India. Both of them have thus ceased to be a Member of the Rajya Sabha with immediate effect. I decide and declare accordingly." "This was the order and decision and I am enclosing a copy of the order for your reference. Congratulations to all party workers for being united with our leader and National President Nitish (Kumar) jI. Thank you!" he said attaching the copy of the Rajya Sabha secretariat order. The action comes in the wake of the petition filed by Bihar Chief Minister Nitish Kumar faction seeking the Rajya Sabha Chairman disqualify Sharad Yadav and Ansari. Speaking to IANS, Sharad Yadav confirmed that a notice was served to him in Delhi late in night today. "I was informed by my wife that a notice has served late in night at around 10 p.m.," he said. He also said that as the notice is over 15 pages, he shall comment on it after going through it in morning. 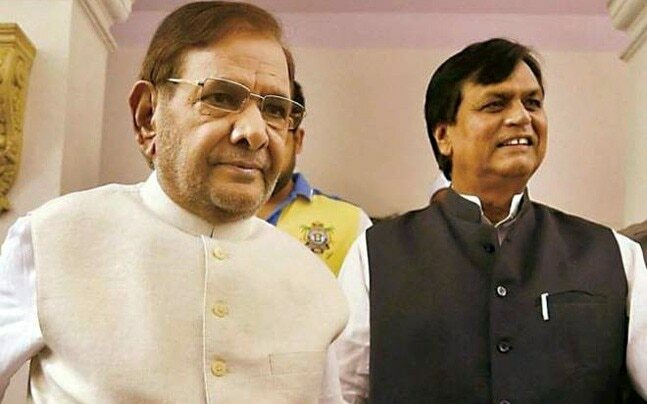 Earlier in the day, Sharad Yadav left for Gujarat to campaign for the party in the assembly election there for his party candidates who are contsting on the symbol of Bharatiya Rashtriya Tribal Party on seven out of 182 seats. He, Ansari and a section of the JD-U fell out with Nitish Kumar after the latter broke away from the "Mahagathbandhan" (Grand Alliance) with the Rashtriya Janata Dal and the Congress to re-align with the Bharatiya Janata Party earlier this year.